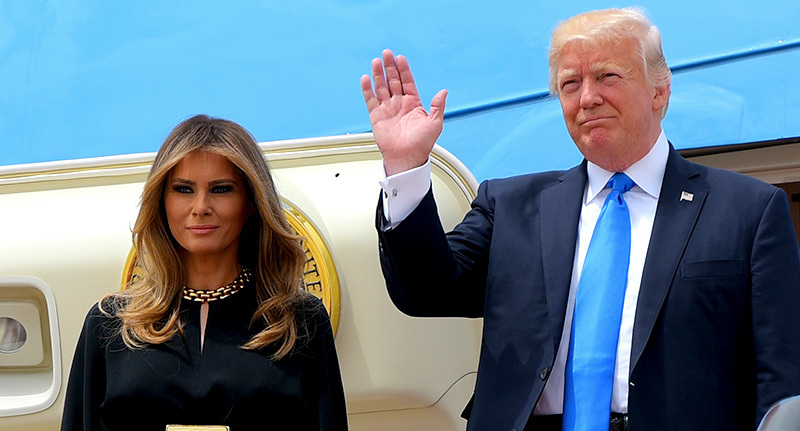 Earlier today, Mr and Mrs Trump arrived at King Khalid International Airport in Riyadh, Saudi Arabia. As the rest of the U.S. spirals into unpredictable disaray following calls for POTUS to be impeached – after he fired James Comey and admitted to leaking confidential information to Russia – Trump is allegedly in Saudi to switch the attention. However, and probably in a move the President will be overjoyed with, it’s not The Donald at the centre of attention. It’s his wife, Melania, and her big ol’ golden belt, reports the Mirror. The President was clad in a standard navy suit with a bright blue tie, and as he stepped out of his jet into the burning heat of the Saudi sun he performed a classic Trumpian wave – the sort of wave that says, ‘you know I really can’t be arsed being here’, the sort of wave you’d pull off at a party you really didn’t want to come to. On the other hand (not literally) Melania Trump wore a dark jumpsuit finished off with the sort of gold accessories that would make Xerxes jealous. OMG,Melania is walking down the steps in a 1970s black look pantsuit trimmed with a huge gold belt and buckle. 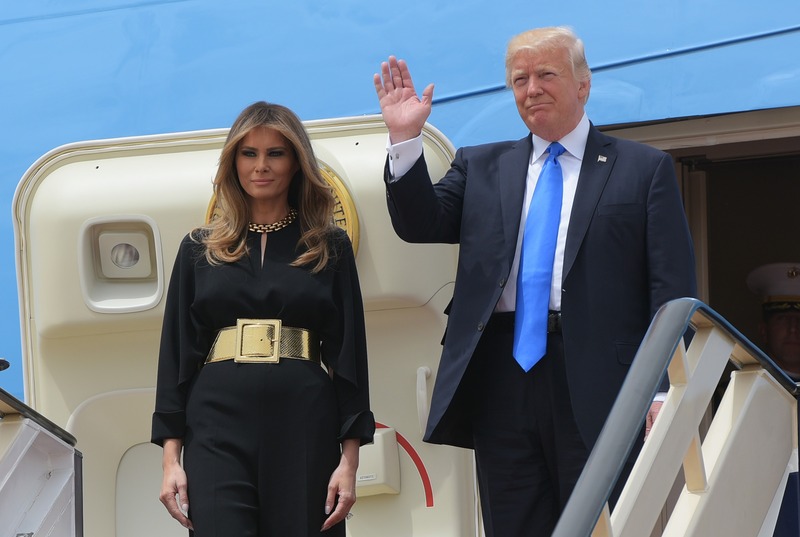 @FLOTUS LOVED your black jumpsuit w/gold belt! So proud of you and @POTUS, and finally getting the respect you both deserve! Trump is performing three summits in the next few days in what will be his longest trip away from the White House since becomming president back in January. Unfortunately it seems the fashion sense of his wife will be the focal talking point.